Professor Claudio Finkelstein recently presented his lecture "Recent Developments in International Arbitration in South America (From a Brazilian Perspective)" as part of theInternational Law Lecture Series, which was co-sponsored by the International Graduate Law Programs and the International Law Society. 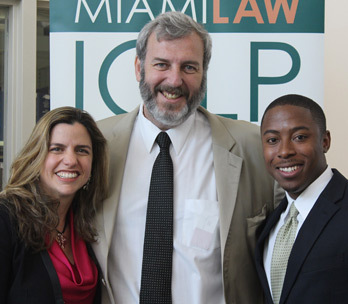 "Professor Claudio Finkelstein's lecture was very informative about international arbitration in South America," said Jessica Carvalho Morris, director of International Graduate Law Programs. "As an experienced arbitration practitioner, his expertise provided great insight into the development of international arbitration in the region as well as how different countries in South America are enforcing arbitral awards." Finkelstein is a Professor in the Post-Graduate Program in Law, and the Coordinator of International Economic Relations Post-Graduate Program at Pontificia Universidade Catolica de São Paulo (PUC/SP). He is also the head of the International Law Department of the Brazilian Institute in Constitutional Law and the National Litigation Institute, and co-coordinator of the Law Review Revista de Direito Internacional e Economico. He is the author of books and articles in the areas of international arbitration, commercial, corporate, constitutional and international law. He is an arbitrator working with the main arbitration institutions of Brazil, as well as the ICC and the LCIA. He is also a partner at Finkelstein Advogados in São Paulo, Brazil. Finkelstein holds an LL.M. degree in Comparative Law from Miami Law and a J.D. equivalent and Ph.D. from PUC/SP. To watch Professor Finkelstein's lecture, click here.